lindell mid-century modrn walking tour - B.E.L.T. Join Michael Allen (Ecology of Absence) and myself for a walking tour of mid-century modern buildings on Lindell Boulevard in the Central West End, St. Louis, MO. This second edition of our tour is part of the Open Streets 2010 event, and is co-sponsored by the St. Louis Building Arts Foundation. This tour is free, while the knowledge and appreciation of Lindell’s thick and rich stock of MCM buildings is priceless. Here’s an overview of some of the buildings you will see up close and narrated. 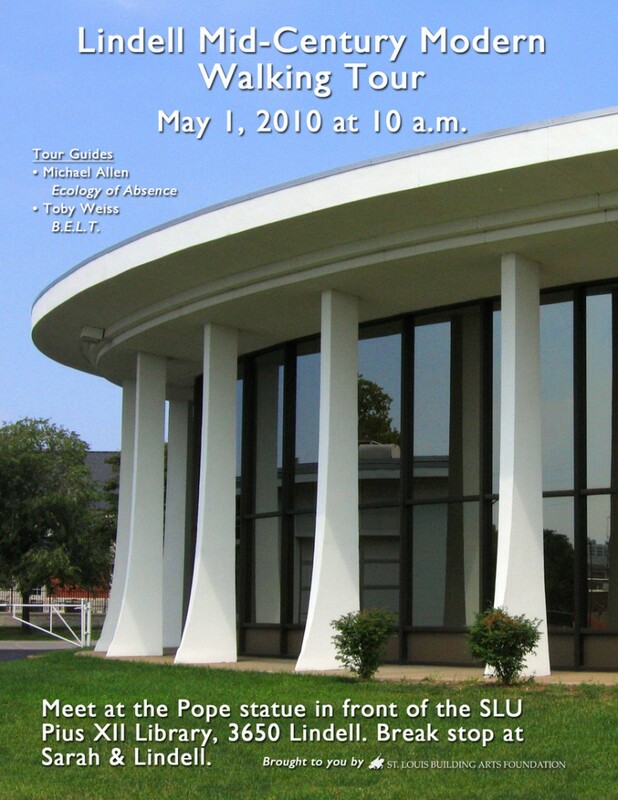 Meet us at 10 a.m. on Saturday, May 1st, at the Pope statue in front of St. Louis University’s Pius XII Library, 3650 Lindell Boulevard (the Pius XII is a breathtaking MCM beauty – check it out here). The official leg of the tour is from Pius XII to the former Housing Authority building (recently saved from the CVS wrecking ball) at Sarah & Lindell. We will take a short break stop, and continue with the unofficial portion of the tour from Sarah to Kingshighway. Join us at 10 a.m., or catch up with us at any point on the walk. Look for a large group of people completely smitten with the mid-century modern treasures of the Central West End. We look forward to sharing the riches with you!